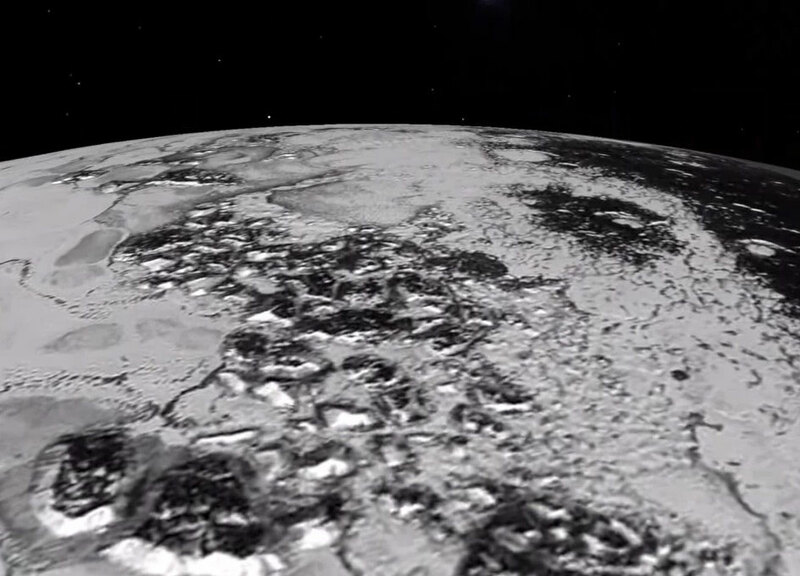 It is no easy task to capture the shadow of Pluto as it travels across the surface of Earth at more than 53,000 mph--but that is exactly what NASA scientists and flight crew did on the night of June 29, 2015. 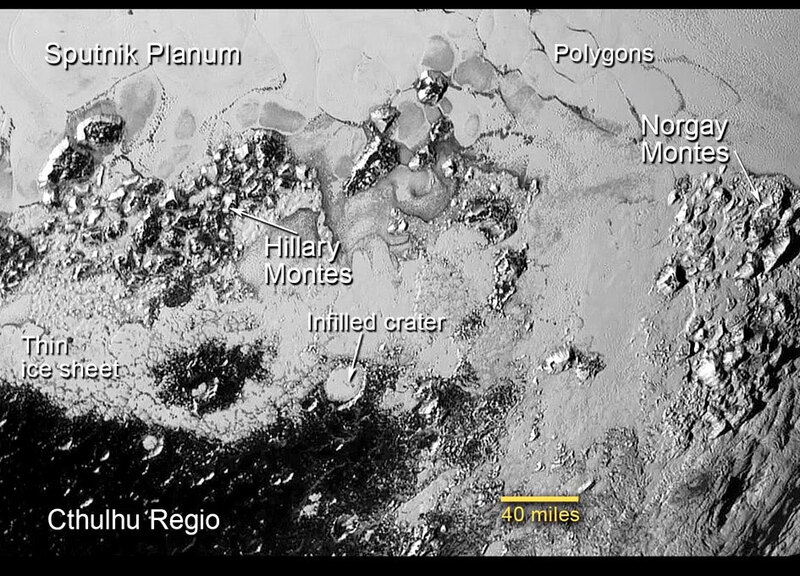 This simulated flyover of two regions on Pluto, northwestern Sputnik Planum (Sputnik Plain) and Hillary Montes (Hillary Mountains), was created from New Horizons close-approach images. 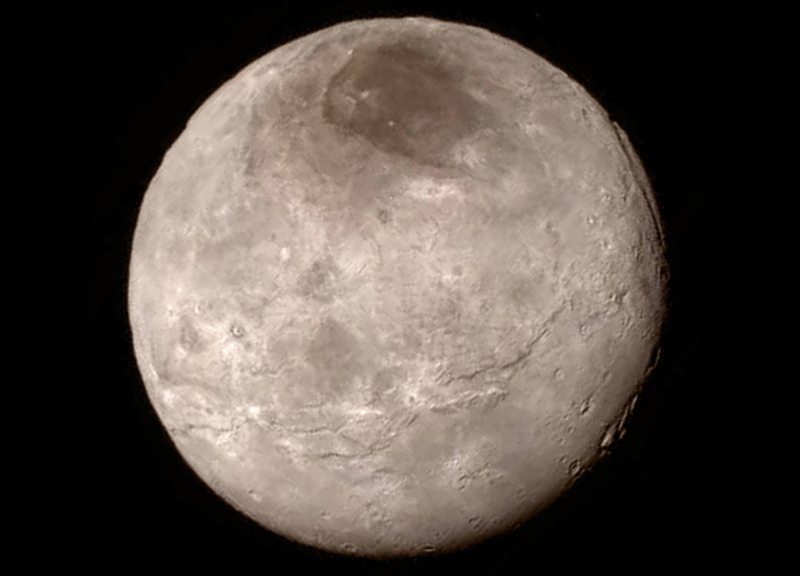 Sputnik Planum has been informally named for Earth's first artificial satellite, launched in 1957. 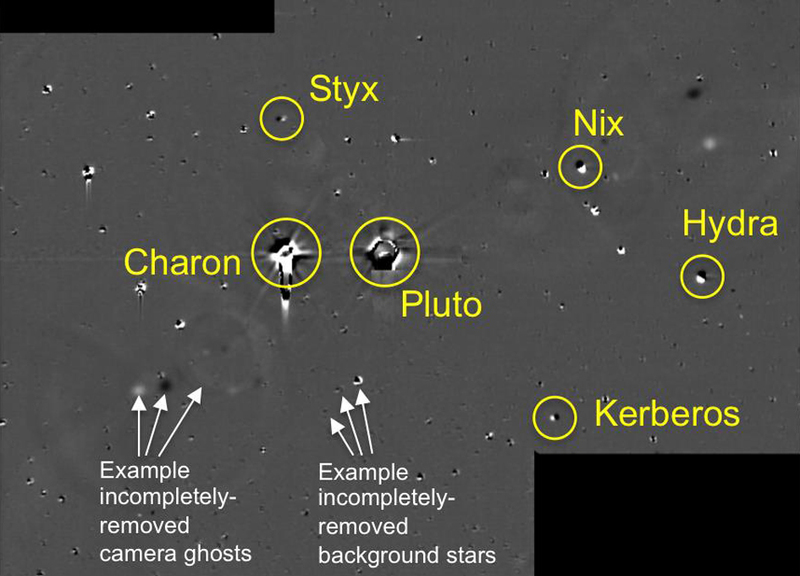 During a July 24 science update at NASA headquarters, new surprising imagery and science results were revealed from the recent flyby of Pluto, by the New Horizons spacecraft. 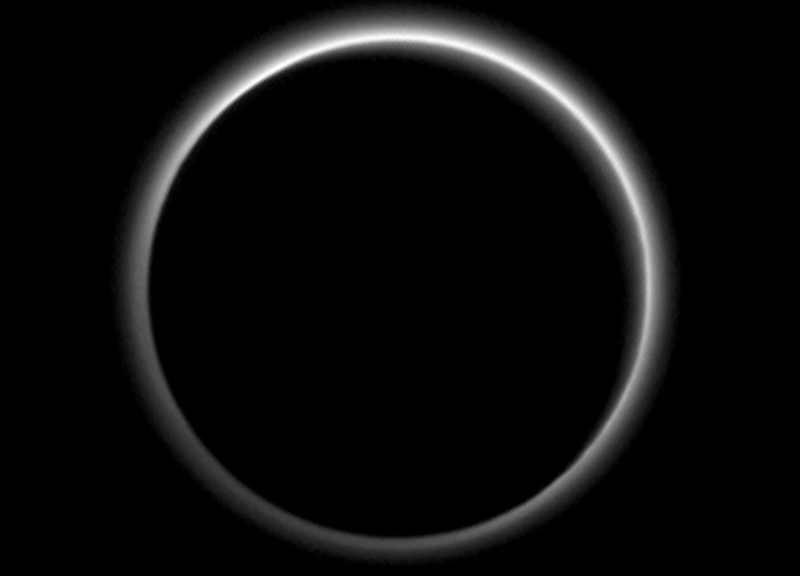 Speeding away from Pluto just seven hours after its July 14 closest approach, the New Horizons spacecraft looked back and captured this spectacular image of Pluto's atmosphere, backlit by the sun. 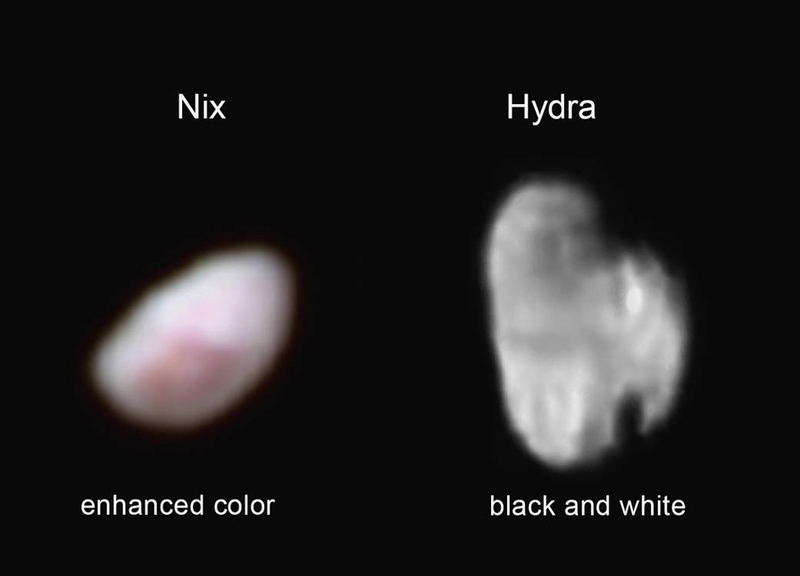 New Horizons scientists use enhanced color images to detect differences in the composition and texture of Pluto's surface. 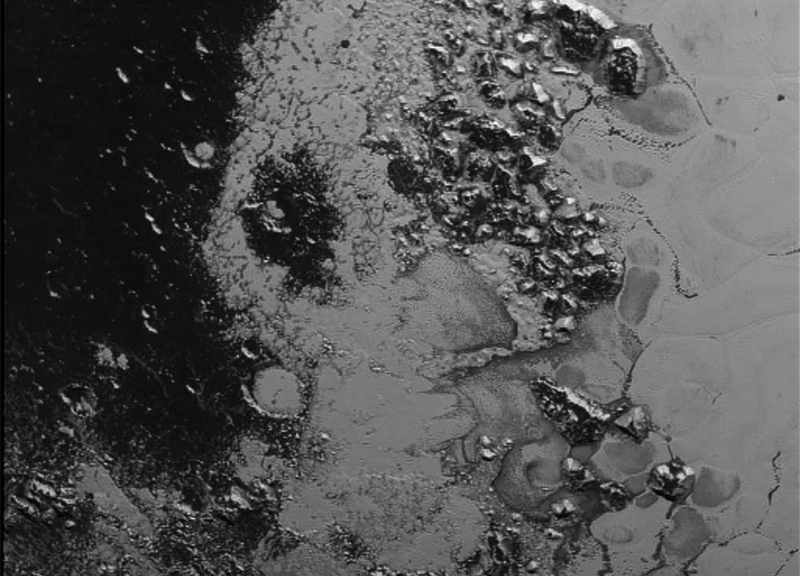 A newly discovered mountain range lies near the southwestern margin of Pluto's Tombaugh Regio (Tombaugh Region), situated between bright, icy plains and dark, heavily-cratered terrain. 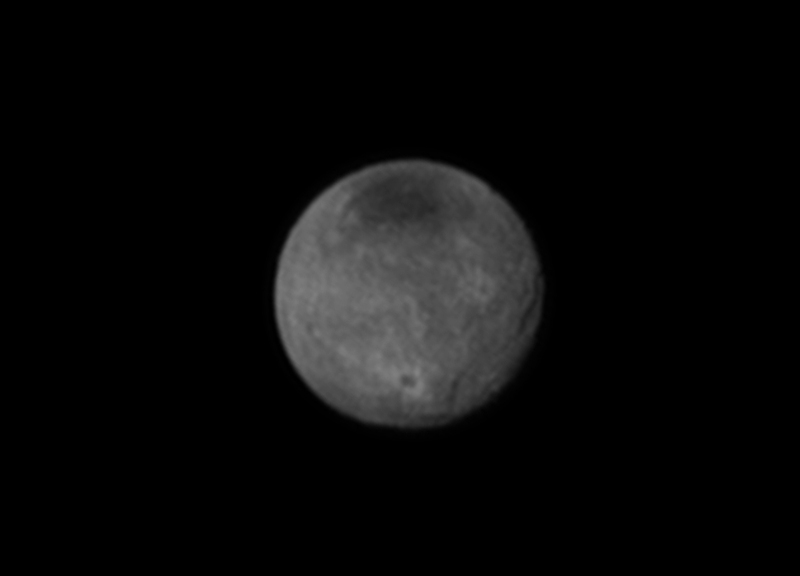 While Pluto's largest moon Charon has grabbed most of the lunar spotlight, two of Pluto's smaller and lesser-known satellites are starting to come into focus via new images from the New Horizons spacecraft. 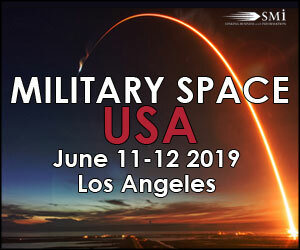 Griffith Observatory Curator Dr. Laura Danly and Griffith Observatory Director Dr. E.C. 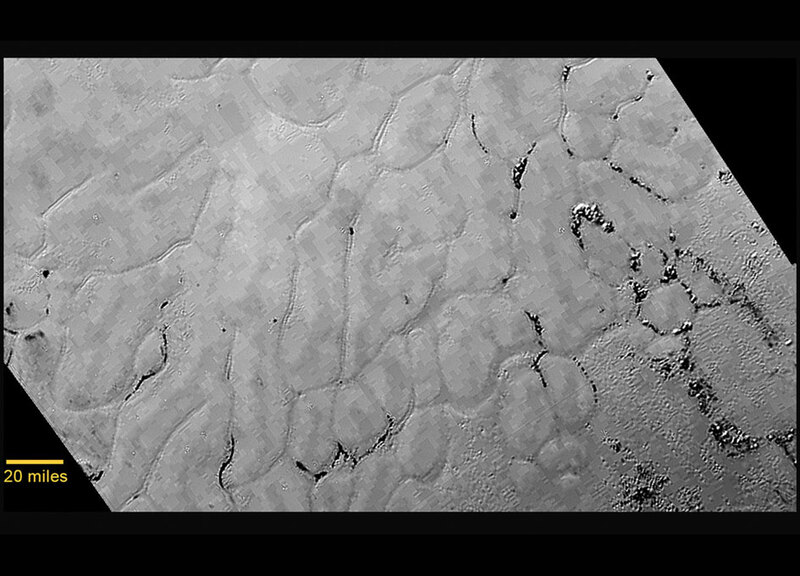 Krupp show the latest images of Pluto from New Horizons and illustrate Pluto's impact on culture from its discovery until now. 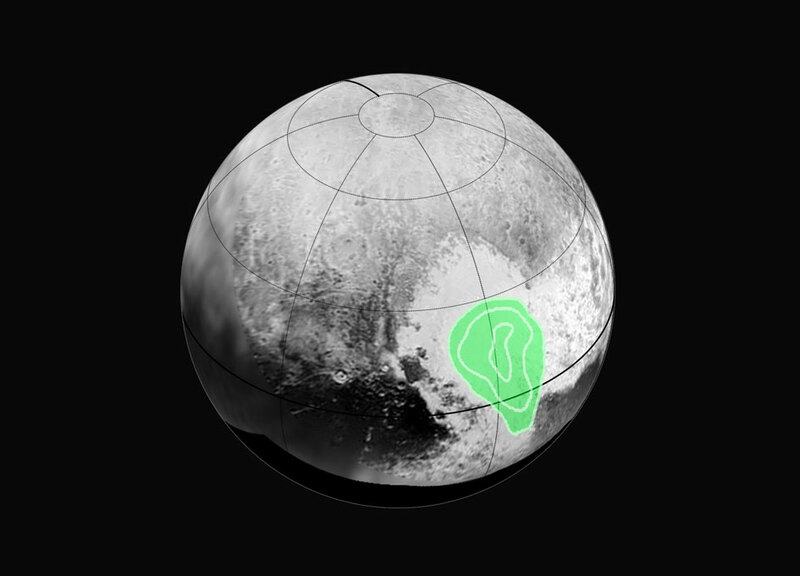 Peering closely at the "heart of Pluto," in the western half of what mission scientists have informally named Tombaugh Regio (Tombaugh Region), New Horizons' Ralph instrument revealed evidence of carbon monoxide ice. 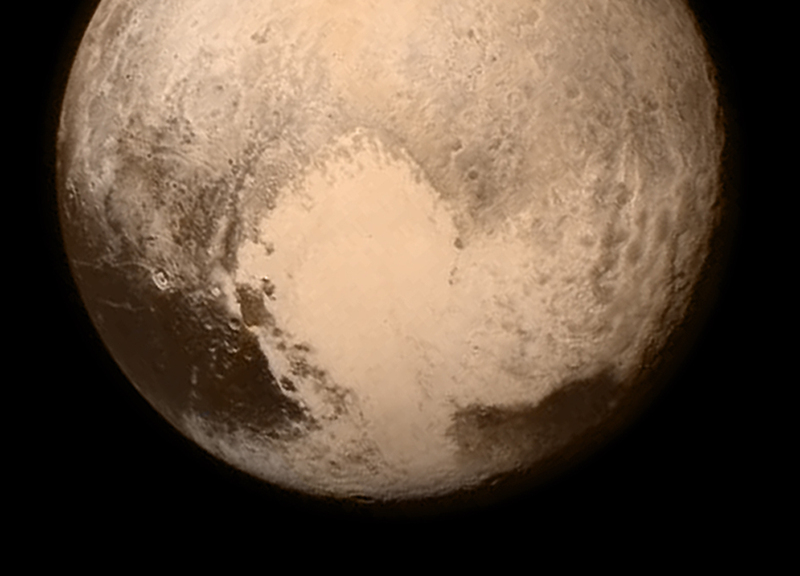 NASA wrapped up a week of historic news from Pluto with more amazing images and scientific discoveries. 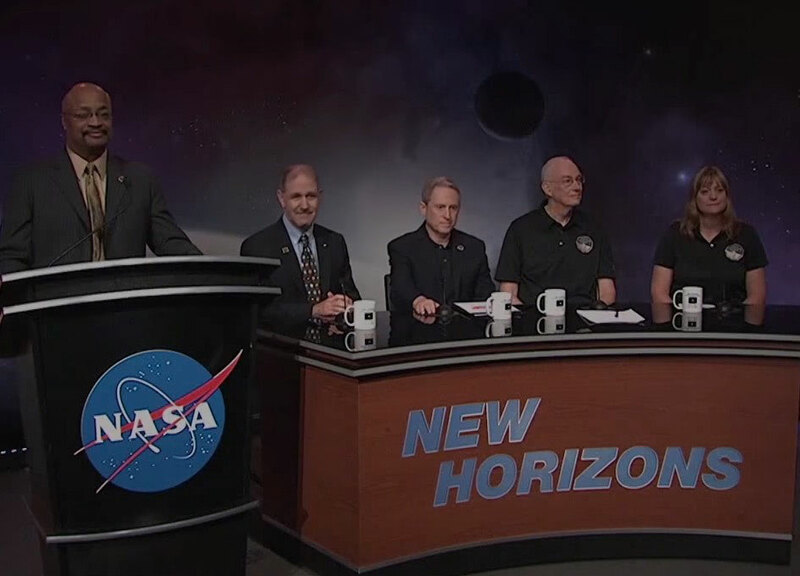 Starting next week, NASA will transition to weekly news conferences as there's new data to present. 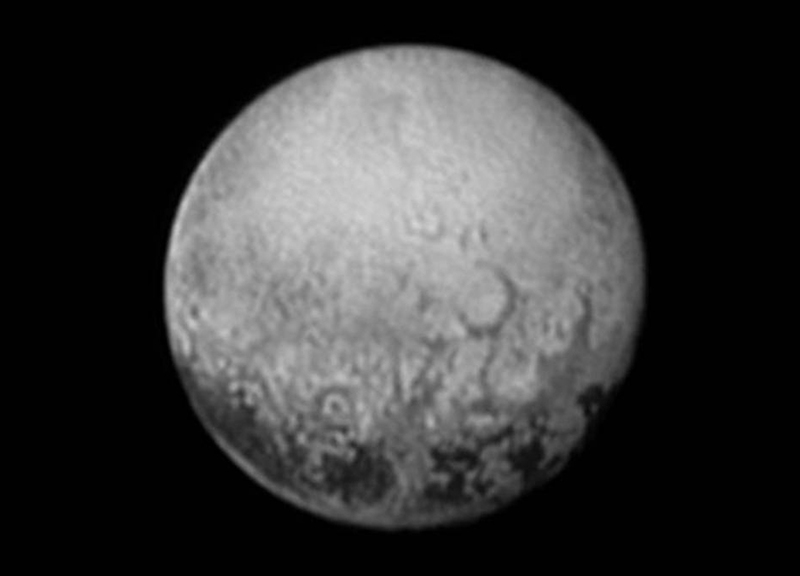 In the latest data from NASA's New Horizons spacecraft, a new close-up image of Pluto reveals a vast, craterless plain that appears to be no more than 100 million years old, and is possibly still being shaped by geologic processes. 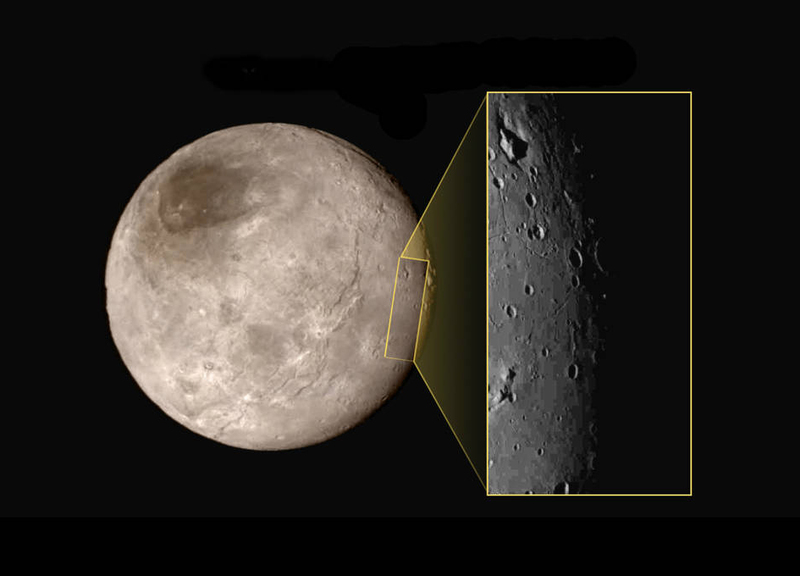 This new image of an area on Pluto's largest moon Charon has a captivating feature -- a depression with a peak in the middle, shown here in the upper left corner of the inset. 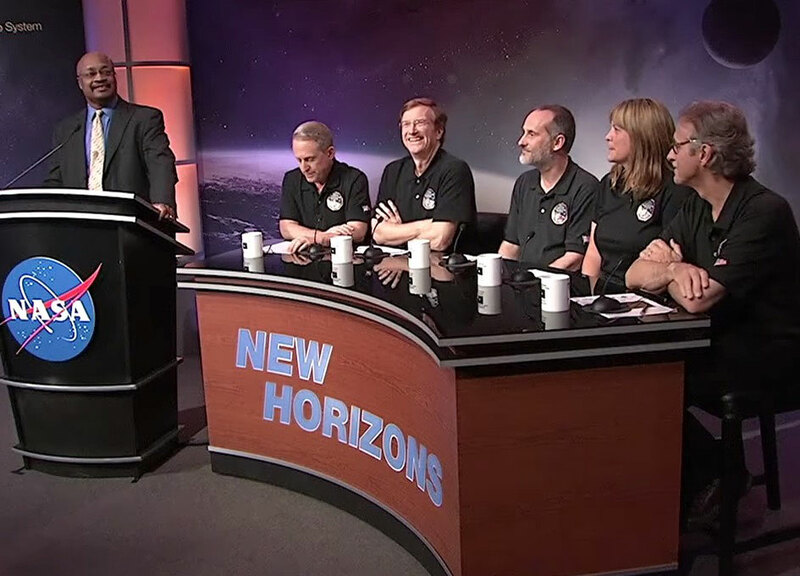 NASA officials and team members of the New Horizons mission to Pluto participate in a news conference featuring release of the first ever close-up images of Pluto's surface and moons, and initial reactions from the New Horizons science team. 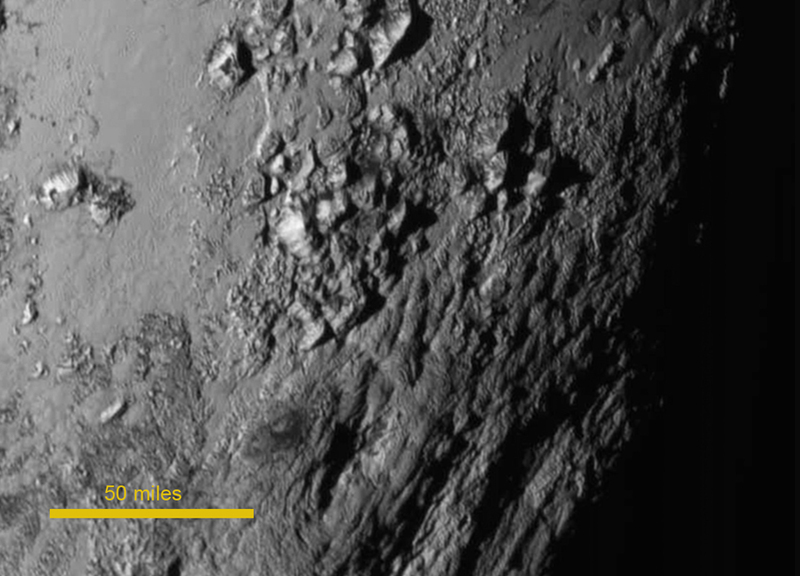 New close-up images of a region near Pluto's equator reveal a giant surprise: a range of youthful mountains rising as high as 11,000 feet (3,500 meters) above the surface of the icy body. 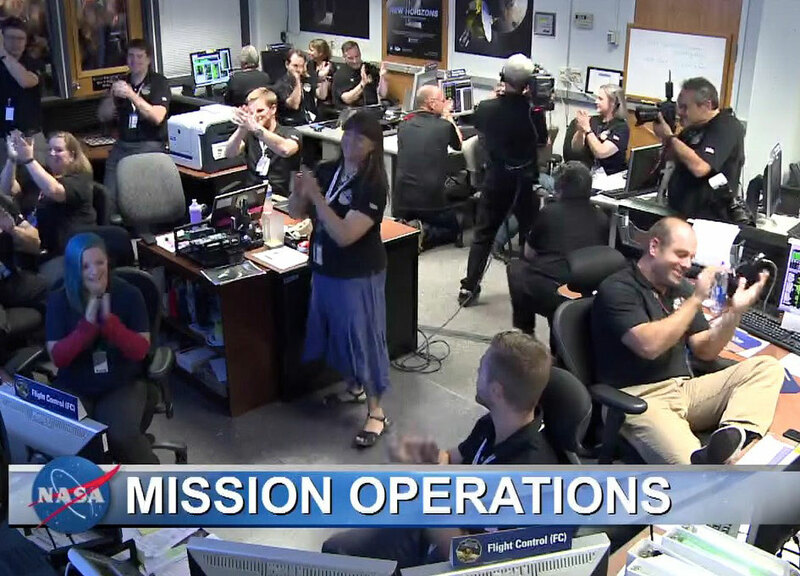 After a gut wrenching day for mission team members, New Horizons contacted Earth on schedule and reported its systems were all green and that it had collected the amount of data expected after is closest approach to the ice world. 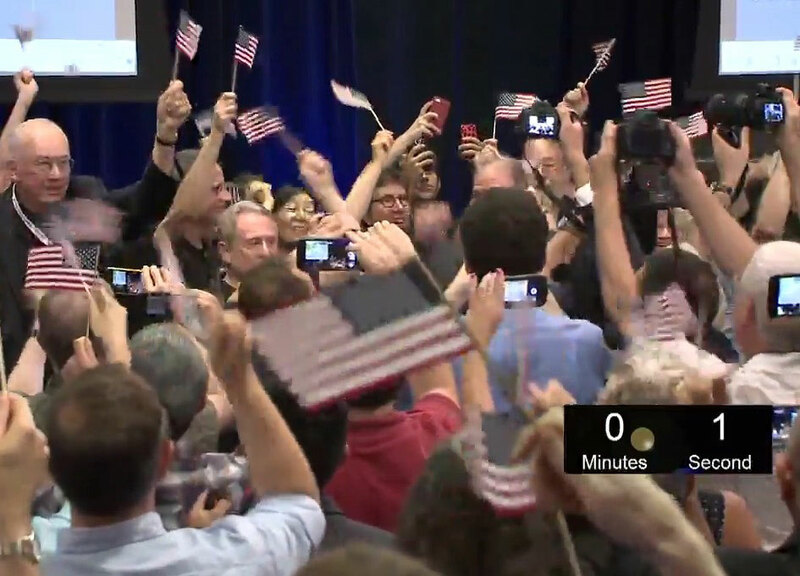 NASA TV's coverage of the historic New Horizons mission to Pluto included a the reaction to the transmission by the New Horizons spacecraft of a preprogrammed signal after its closest approach to Pluto. 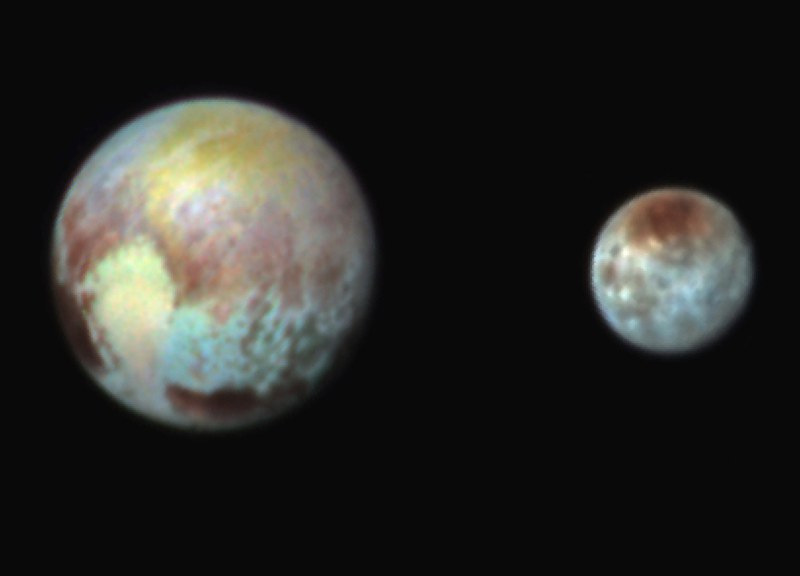 New Horizons has obtained impressive new images of Pluto and its large moon Charon that highlight their compositional diversity. 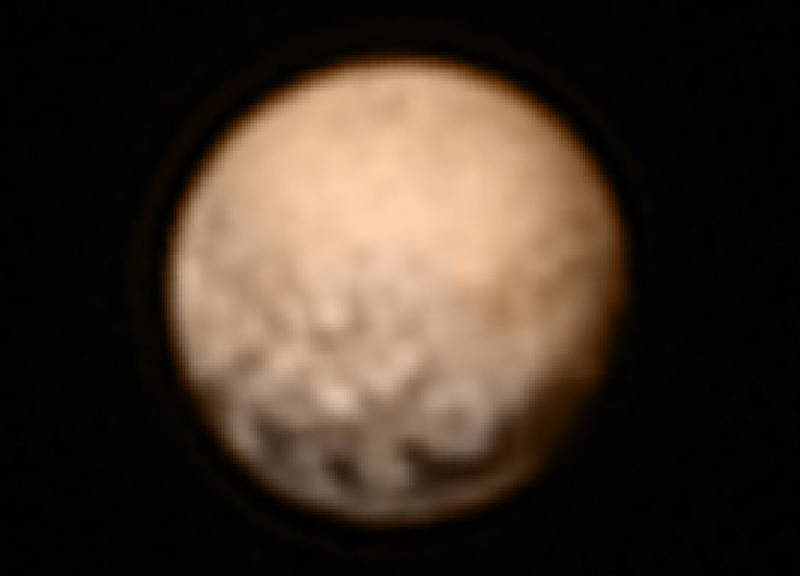 After its closest approach to Pluto NASA held a media briefing to provide a mission update. 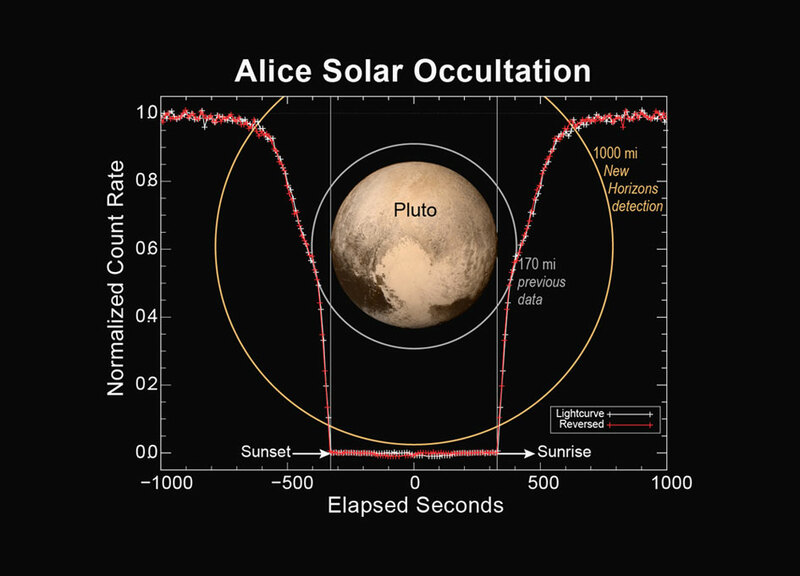 At approximately 7:49 a.m. on July 14, NASA's New Horizons spacecraft is scheduled to be as close as it will get to Pluto, approximately 7,800 miles (12,500 kilometers) above the surface. 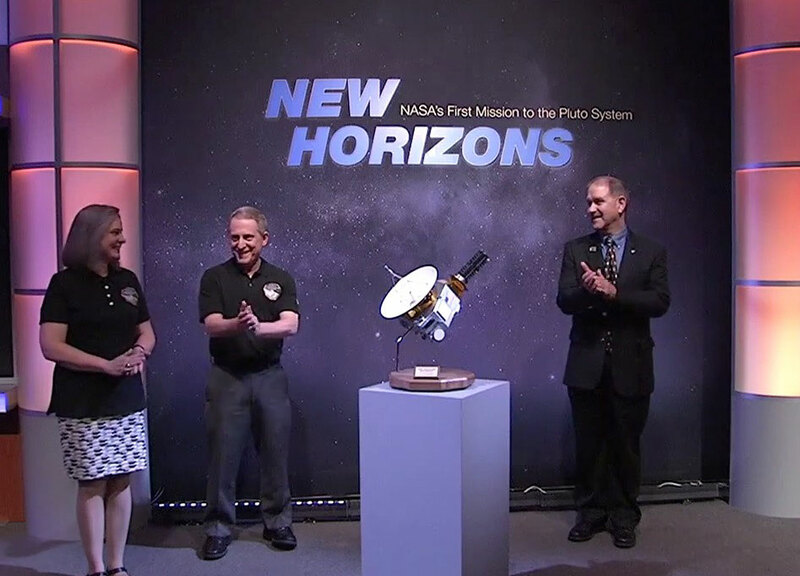 This historic moment is part of NASA's coverage of New Horizons' nine year, three billion mile journey to the Pluto system to gather data about Pluto and its moons. 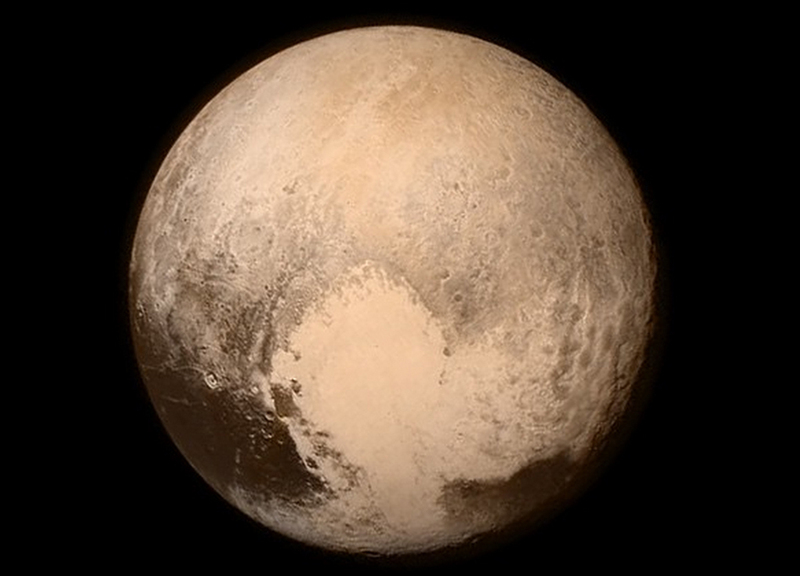 As New Horizons flew by Pluto on its closet approach today NASA released the best ever image of the planet. 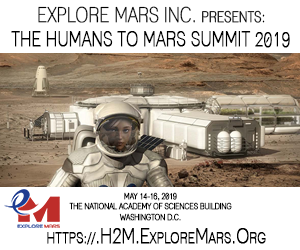 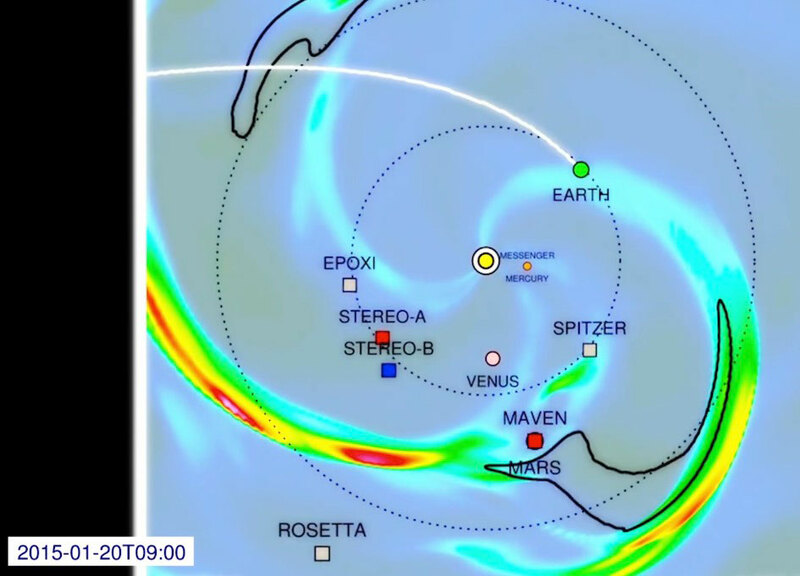 Should the spacecraft has survived its closet approach and did collect the data it was expected to, we should see much more stunning images in the coming days. 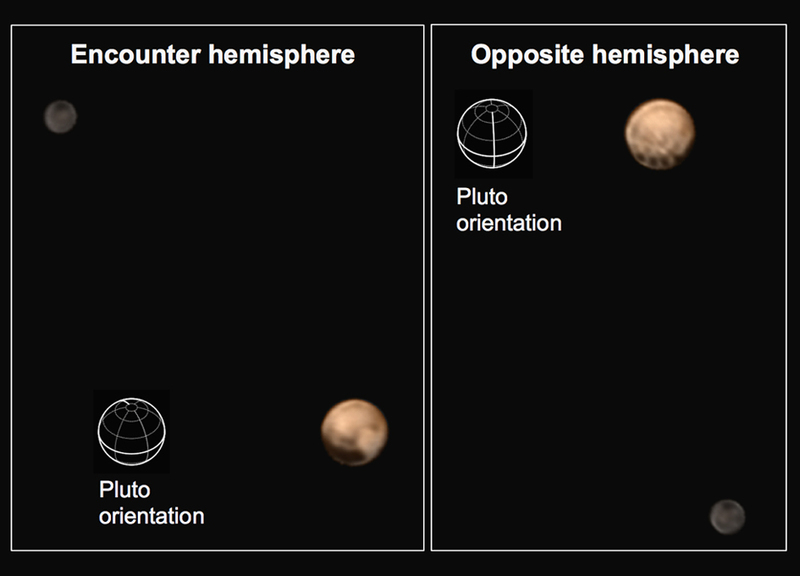 "The exploration of Pluto and its moons by New Horizons represents the capstone event to 50 years of planetary exploration by NASA and the United States," said NASA Administrator Charles Bolden." 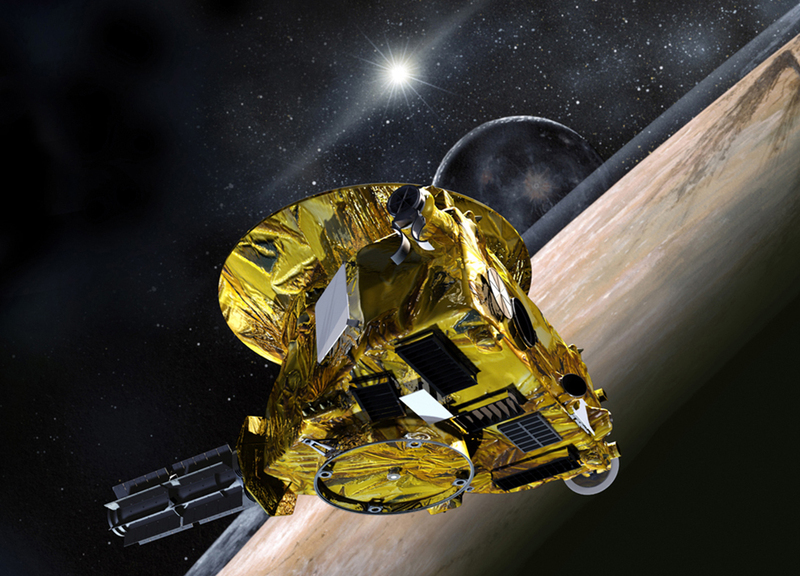 NASA's New Horizons spacecraft is speeding towards Pluto for the first-ever flyby on July 14, 2015. 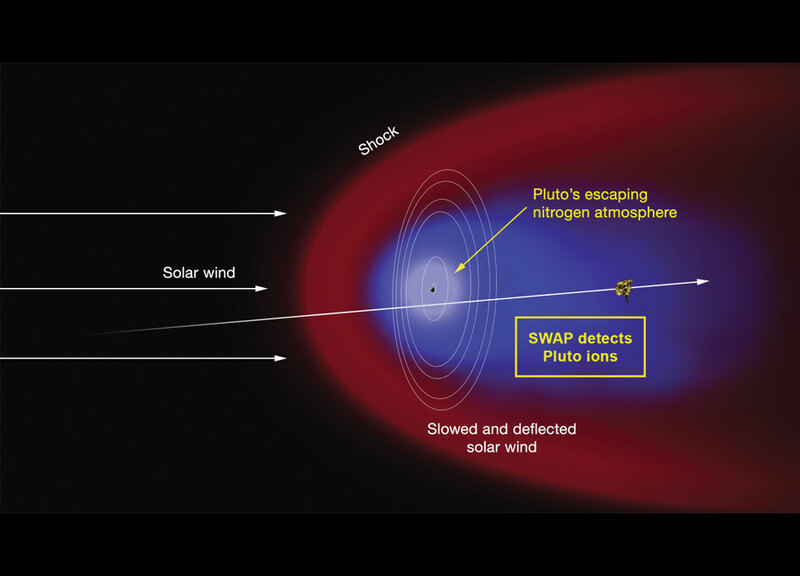 Scientists are eager to collect data on the dwarf planet's chemical and atmospheric makeup, and the Ralph spectrometer will do just that. 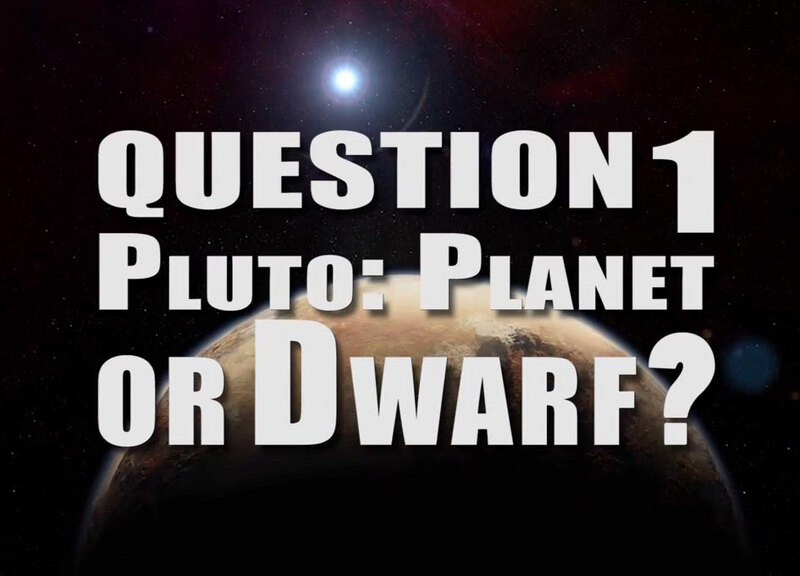 Instrument scientist Dennis Reuter discusses Ralph, Pluto, and exploration of our solar system's last frontier, the Kuiper Belt. 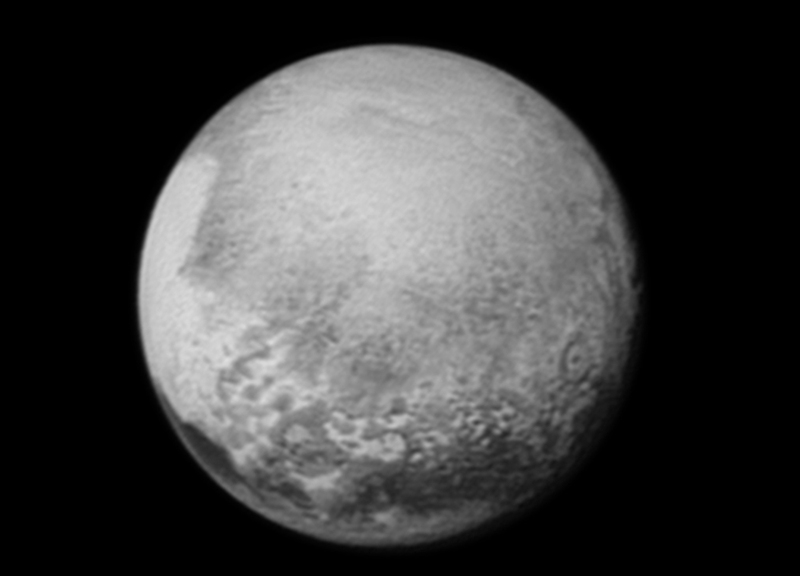 T-Minus 1 days and counting before the Pluto flyby. 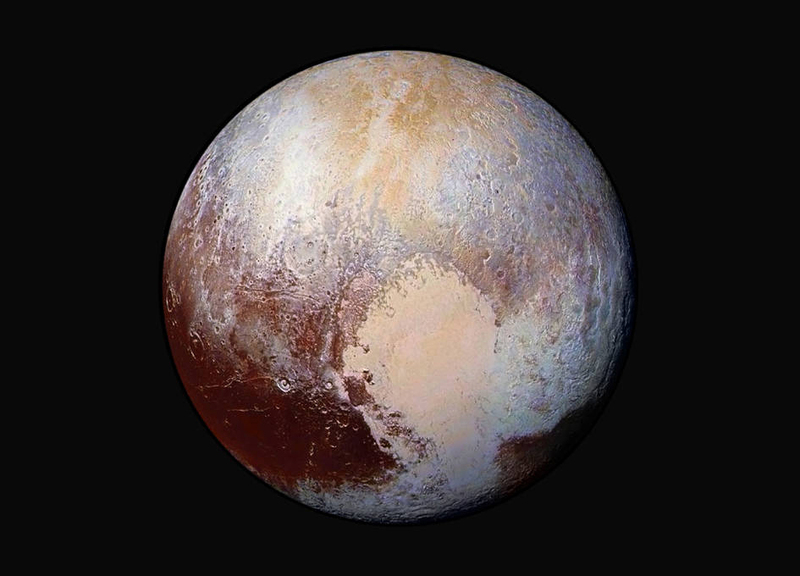 This is the July 13th daily pre-flyby overview of the New Horizons mission, the spacecraft and its suite of instruments and a summary of Pluto science to date from the Johns Hopkins University Applied Physics Laboratory (APL) in Laurel, Maryland, site of the mission operations center. 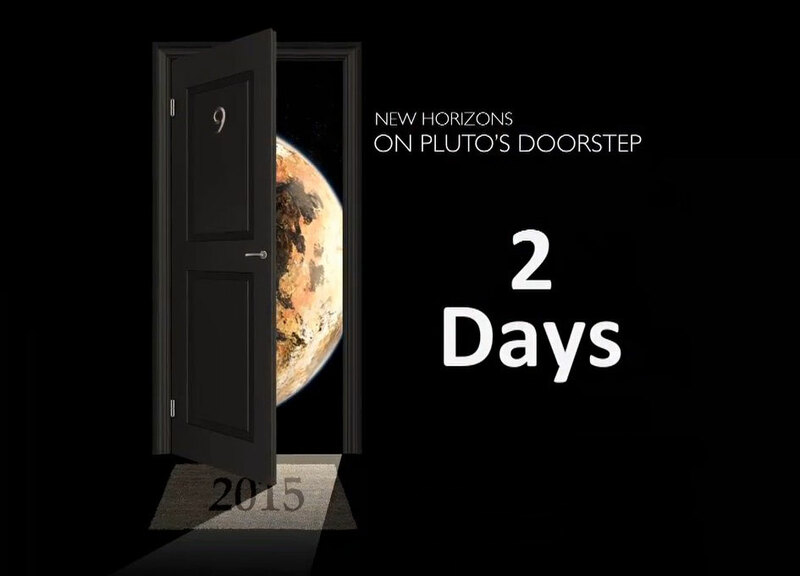 T-Minus 2 days and counting before the Pluto flyby. 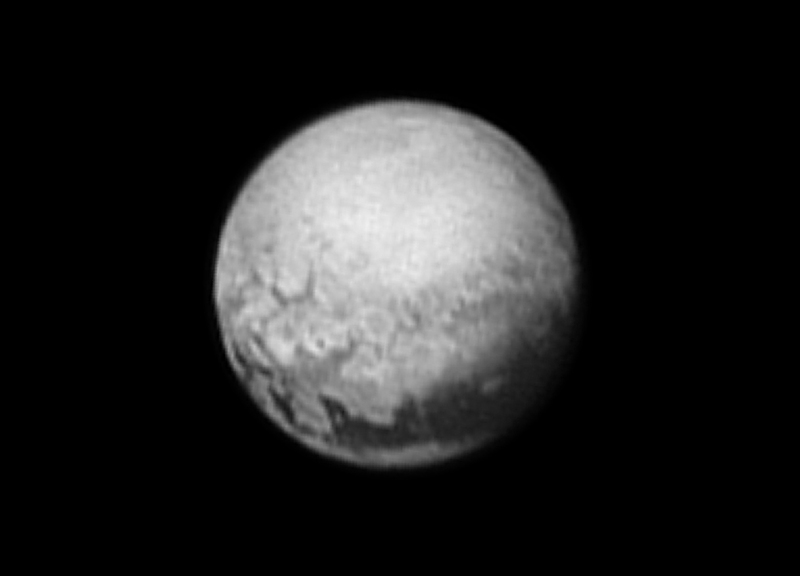 This is the July 12th daily pre-flyby overview of the New Horizons mission, the spacecraft and its suite of instruments and a summary of Pluto science to date from the Johns Hopkins University Applied Physics Laboratory (APL) in Laurel, Maryland, site of the mission operations center. 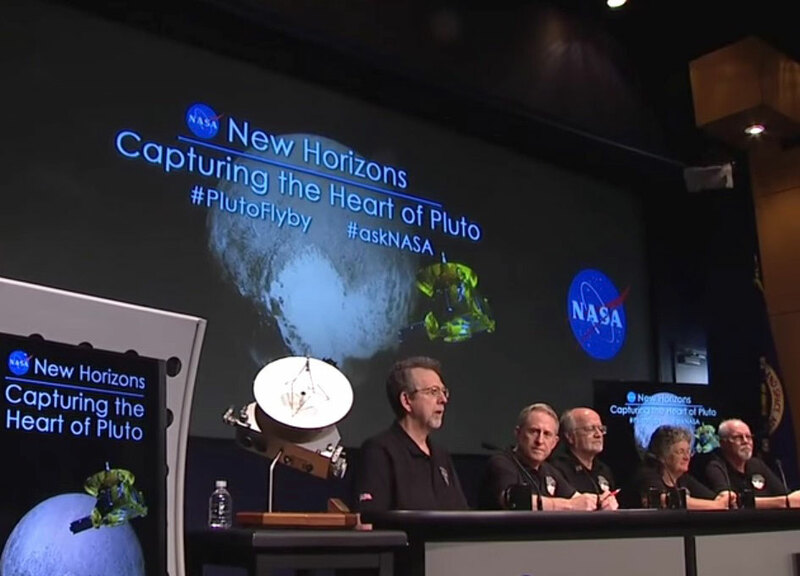 July 11th daily pre-flyby overview of the New Horizons mission, the spacecraft and its suite of instruments and a summary of Pluto science to date from the Johns Hopkins University Applied Physics Laboratory (APL) in Laurel, Maryland, site of the mission operations center. 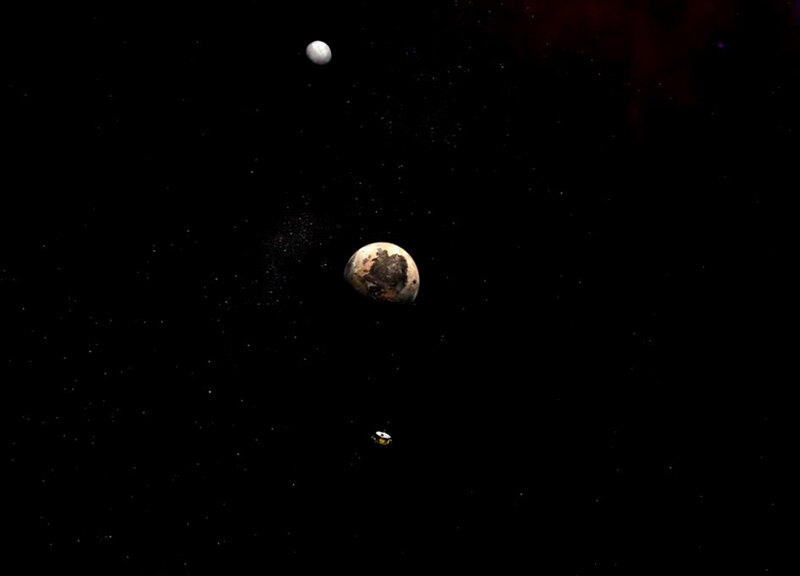 It began as a point of light. 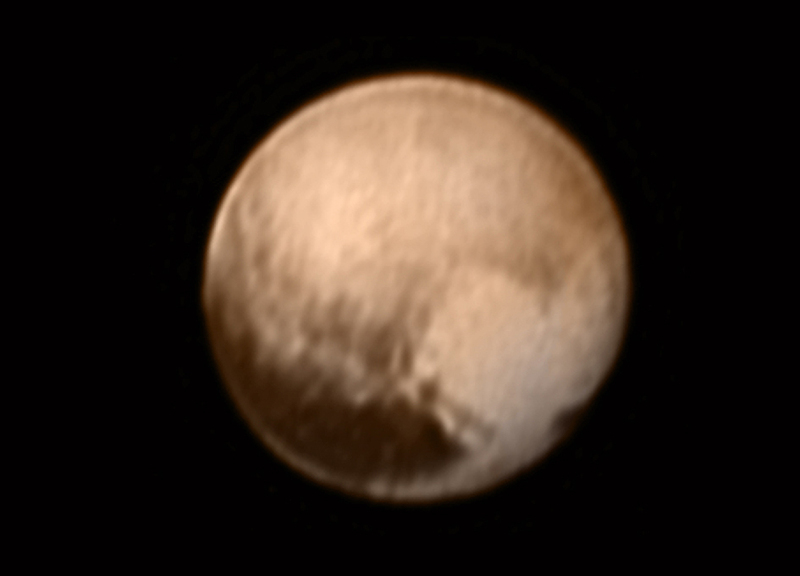 Then, it evolved into a fuzzy orb. 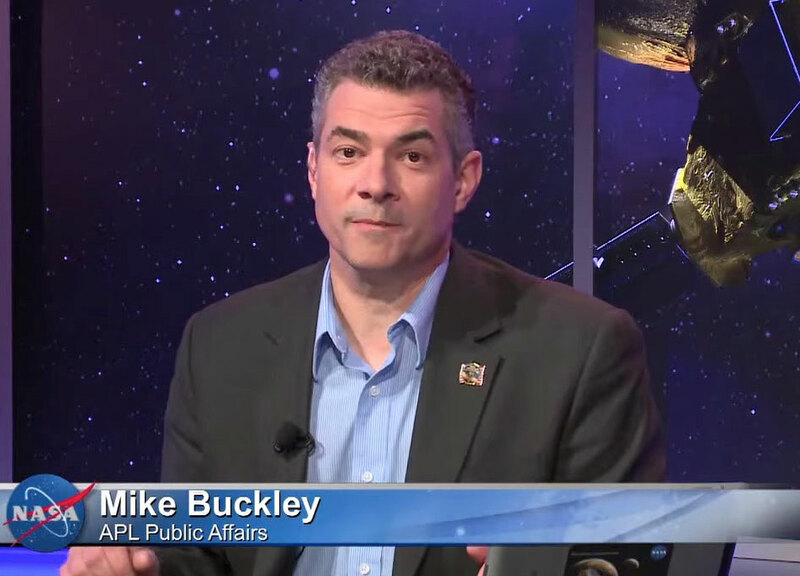 July 10th daily pre-flyby overview of the New Horizons mission, the spacecraft and its suite of instruments and a summary of Pluto science to date from the Johns Hopkins University Applied Physics Laboratory (APL) in Laurel, Maryland, site of the mission operations center. 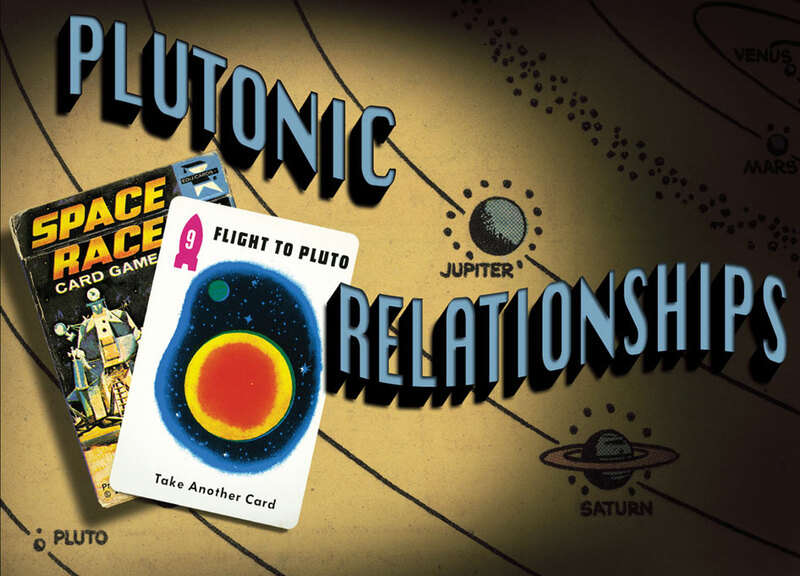 A few months before New Horizons was due to reach Pluto, a community of scientists came together to determine just what kind of a environment the mission would experience during its historic flyby. 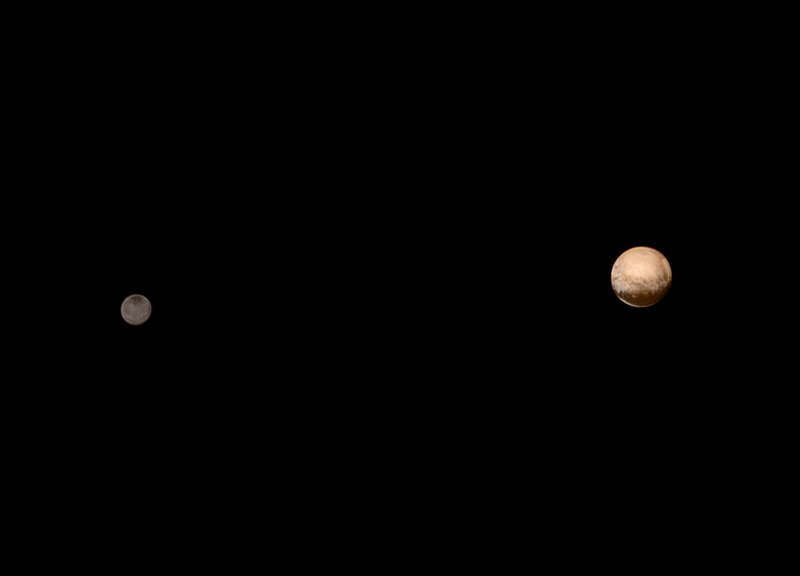 They're a fascinating pair: Two icy worlds, spinning around their common center of gravity like a pair of figure skaters clasping hands. 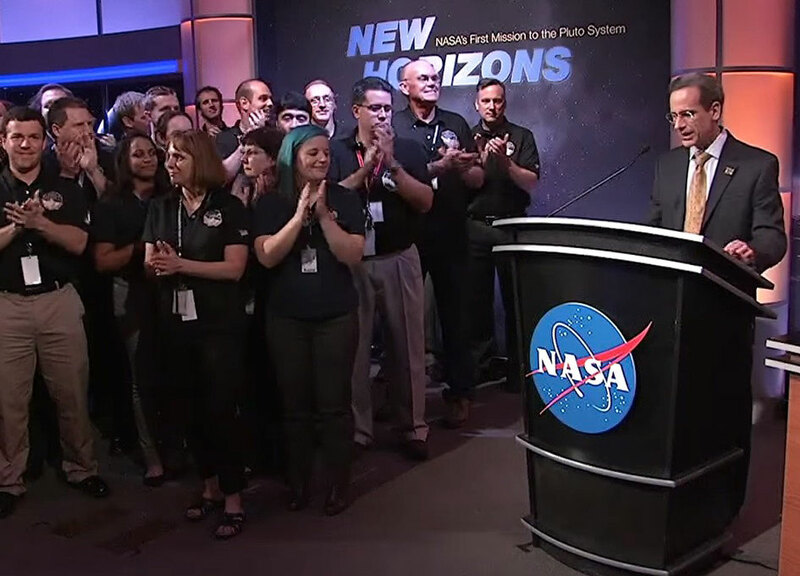 After a more than nine-year, three-billion-mile journey to Pluto, it's show time for NASA's New Horizons spacecraft, as the flyby sequence of science observations is officially underway. 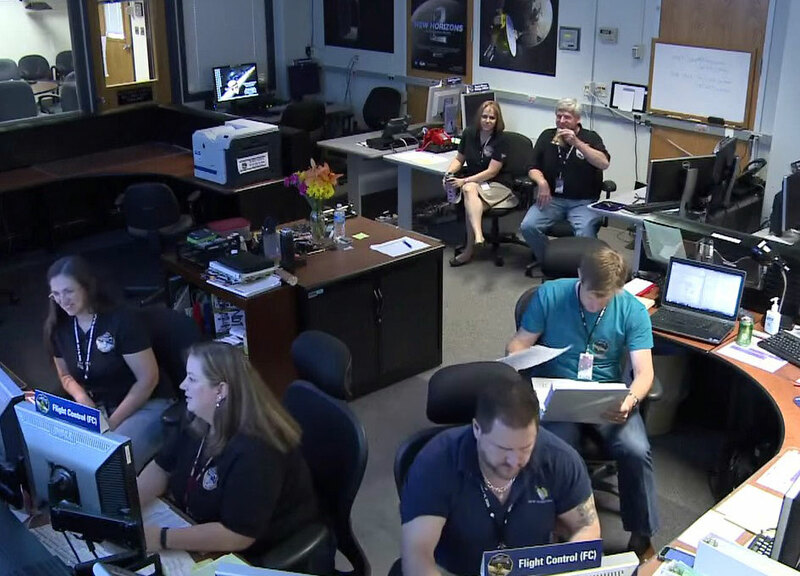 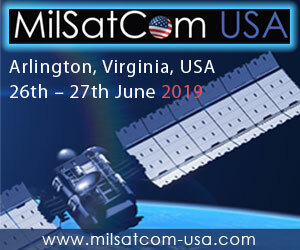 July 8th daily pre-flyby overview of the New Horizons mission, the spacecraft and its suite of instruments and a summary of Pluto science to date from the Johns Hopkins University Applied Physics Laboratory (APL) in Laurel, Maryland, site of the mission operations center. 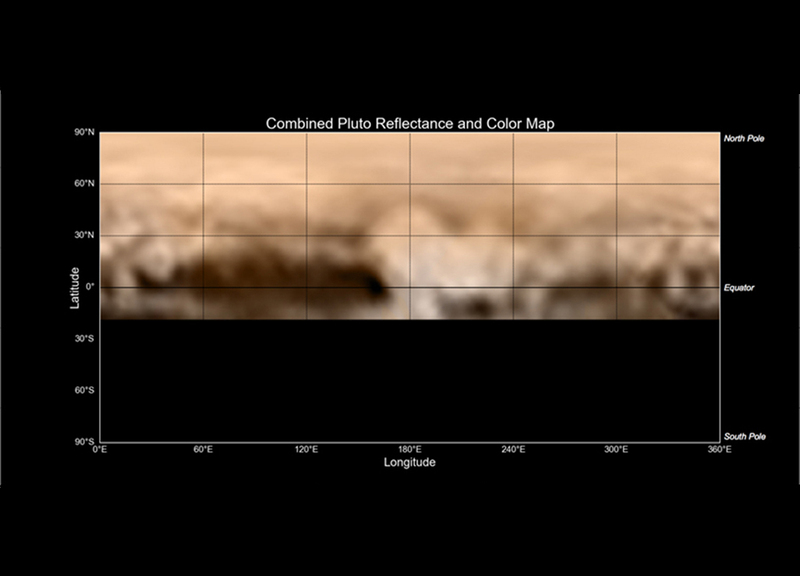 This is the latest map of Pluto created from images taken from June 27 to July 3 by the Long Range Reconnaissance Imager (LORRI) on New Horizons, combined with lower-resolution color data from the spacecraft's Ralph instrument. 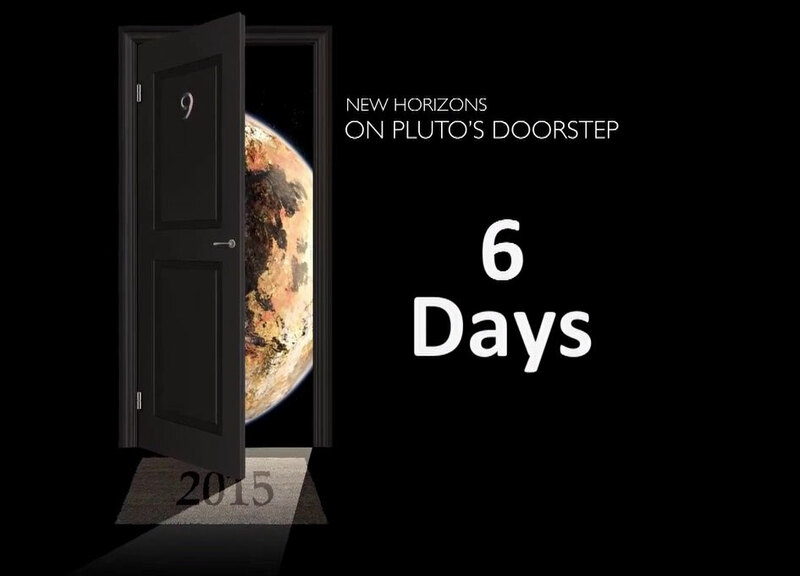 NASA's New Horizons spacecraft will do its closest flyby of Pluto on July 14, 2015. 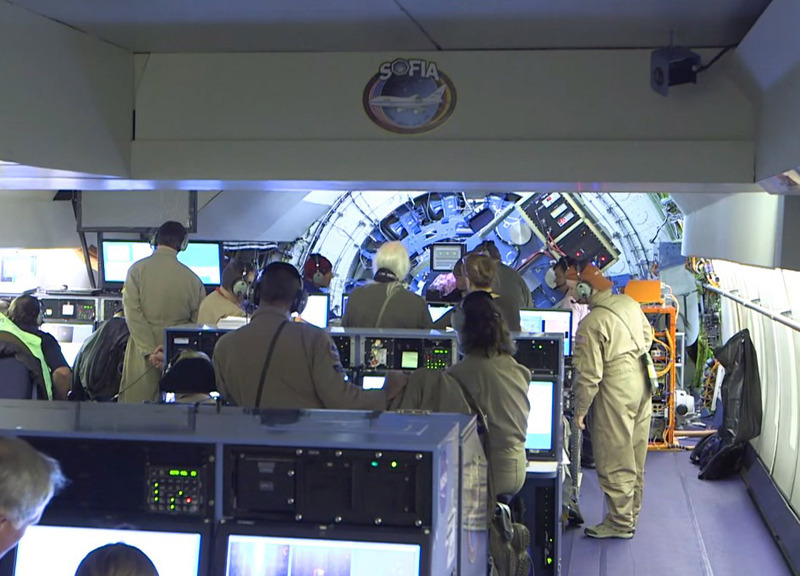 "The Wait" alludes to not just New Horizons' 9-year, 3-billion-mile journey, but also the anticipation of people from all walks of life, excited about the first good look at Pluto.